This wood-swathed NoPa cafe used to be a standard, sandwich-slinging deli. 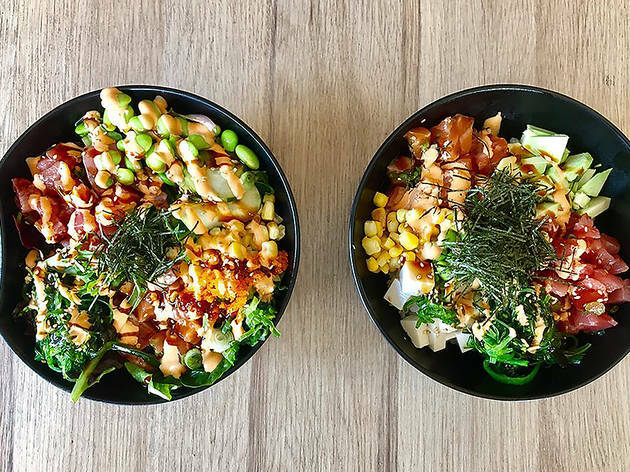 Since launching poke bowls and sushi burritos last year, it’s earned a loyal following. The walls are decked in dog Polaroids and pup-themed decor; Choco, the resident corgi, is often out front. Grab a checklist and choose from ahi tuna, hamachi, snow crab, shrimp, spicy tuna or tofu. 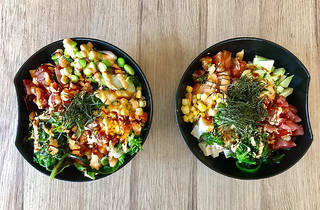 The sides are standard, but uncommonly fresh, including onion, corn, jalapeno, seaweed salad, ginger, masago, scallions, cucumbers, avocado and mango. The wasabi mayo is a revelation.